This New Year, drive in style with new resolutions and the best deals with Chevrolet India’s extended year-end retail offers. The enticing special price offer will continue till 31st January 2017 and are applicable across the bestselling Chevrolet product line – Beat, Enjoy, Cruze and Sail. The customers who are planning to buy new cars can avail offers and savings of upto Rs. 2.45 lacs along with a 3yr/100,000km warranty and a 5 year roadside assistance on all Chevrolet cars. We have received an overwhelming response from our consumers in the last quarter of 2016 and we aim to provide our patrons with same benefits and discounts on 2016 stocks in the New Year as well. By this we wanted to go that extra mile to delight our customers with the attractive New Year offers, which combines irresistible financial deals with comprehensive service packages. The value proposition will go down as we move to 2017 stocks due to the combination of price increase or reduced discount levels. said Jack Uppal, VP Marketing & Customer Experience, Chevrolet India. The retail campaign which went live in the last quarter of 2016 provided exciting offers for the customers which generated positive response. 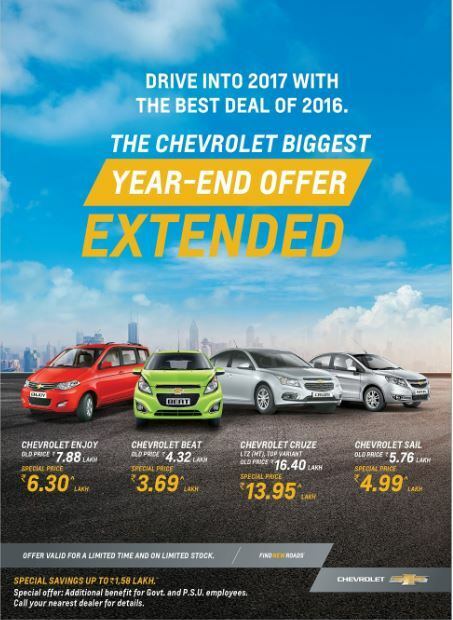 Chevrolet extends the festive offer with additional New Year benefits that the patrons can avail in January 2017. The offers will be valid across all dealerships of Chevrolet in India.